FROG is a kidney cancer support group based in Headington, Oxford. FROG provides information and support in a friendly and informal group. They host interesting and informative speakers, ranging from medics with the latest information on therapies and treatments to practical advice on subjects as diverse as dealing with side effects to getting travel insurance. Meetings are usually on the 1st Monday of the month (one week later when a Bank Holiday), 6.30pm – 8.00pm at Maggie’s Centre, Oxford, OX3 7LE. Patients, family and friends are all welcome. 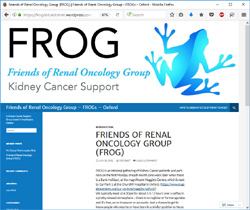 Find out more on the Friends of Renal Oncology Group (FROG) website.